Scuba Diving is one of the most popular water sports activities in the world and Andaman Islands aren’t untouched by that. Besides the calm, peaceful beaches and delicious seafood, diving is what attracts a good chunk of visitors to the Isles. The underwater coastal belts surrounding Andamans is home to one of the densest ecosystem of coral reefs and formations. Most of the islands are enclosed by long stretches of reefs, usually several hundred meters wide and separated by the shore with shallow waters and complimented by volcanic lava hills that make the experience unique and hard to find anywhere else. The untouched, alive corals house some of the world’s most vibrant fishes and sea-dwellers which pop-out from the blue ocean and present a beautiful scene around the diver. Under the protection of the Andaman Administration, the corals and fish are abundant and often enclose the diver from all directions, which leaves the diver in awe and wonder. 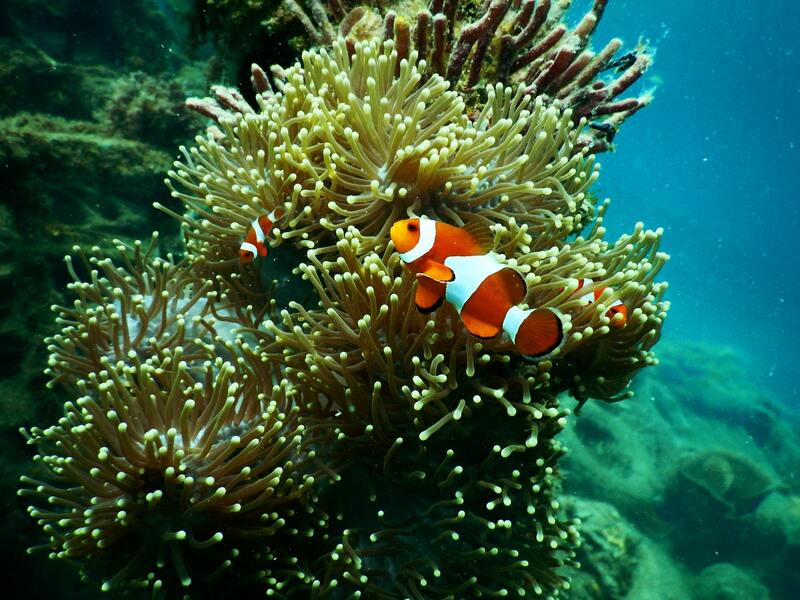 Experience one of the finest Scuba Diving experience in India, during your Andaman Visit. Choosing a place to dive by considering these factors can be difficult and therefore we have compiled a list of best places for Scuba Diving in Andaman. Elephant Beach in Havelock marks every point on the list for a perfect diving experience and is the best place to dive in Andaman for both new and experienced divers. The rich marine life and abundant coral population near the place offers an engaging experience, second to none. 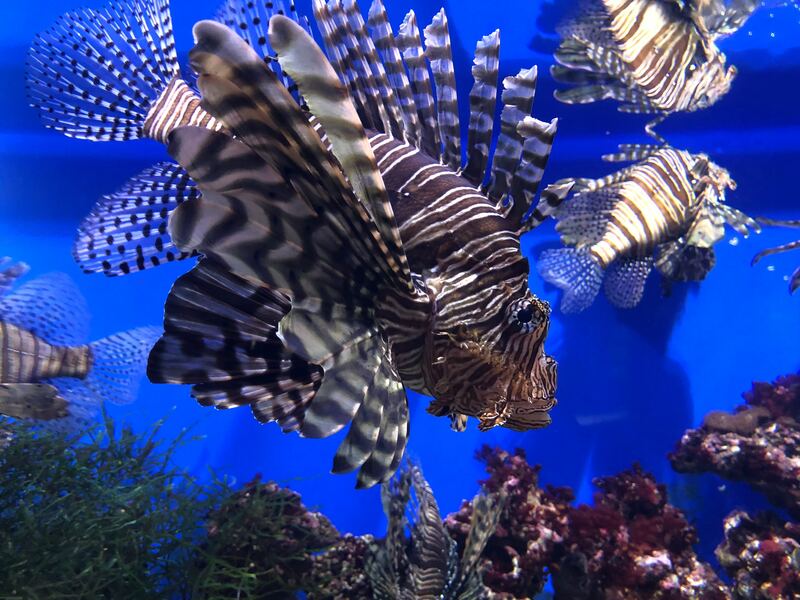 The divers are often enclosed with vibrant fishes and sea dwellers throughout the dive. The perfect blend of clear waters and low water currents makes sure your dive is stress-free and safe. The beach can be reached via a boat and has an extensive number of experienced PADI certified scuba providers. The abundance of providers gives you a lot of choices so you can compare and get the best package for yourself. The best thing is, every trip and package includes a visit to Havelock Island, so you don't have to worry about additional travel expenses and time. There are 9 total places where you can dive in Havelock based on the type of experience you are looking for. Barracuda City is simply the best spot for diving in Andaman for newbies. Long strips of coral belts with the perfect blend of both hard and soft coral population separates it from other locations. The rich ecosystem provides tons of radiant fishes of all species and colors and most of the time, wandering sea turtles can be easily spotted near the corals. Overall the perfect place to dive for a completely unique and memorable experience. This hilly underwater world is best known for a huge underwater rock surrounded by wide variety of marine life. The water is shallow and has a dense population of hard staghorn corals and large number of it's inhabitants including Napoleons, which makes this spot very unique and perfect for people looking to see something new. Aquarium is a little offshore at a distance of 3 Kms from the Elephant Beach and has a lot in store for inexperienced divers. The fringing reefs here are crowded with large groups of colorful fishes. 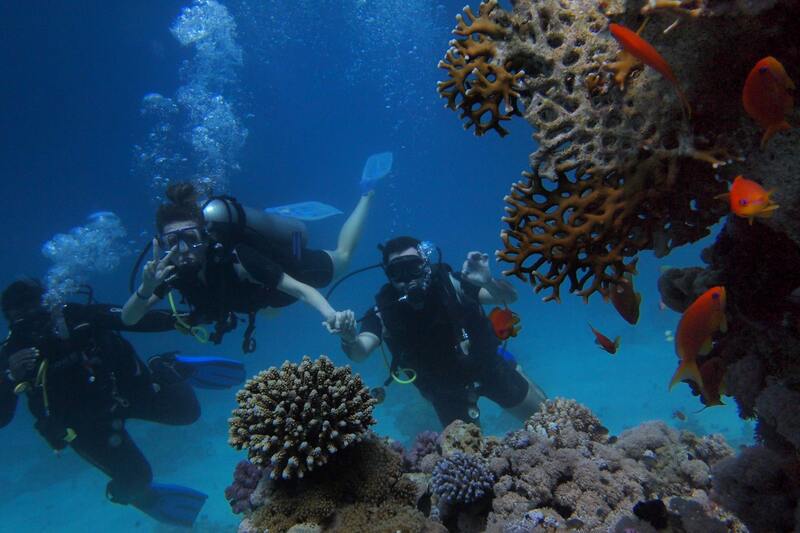 The corals are hard and the water visibility is perfect for a clear view of the marine life. As the name suggests, Turtle Bay has an abundance of sea turtles, and a decent amount of coral population and Rays, which can be spotted in the sand below, which is perfect for people who'd like to see them in their natural habitat. The dive site is decent for inexperienced divers as the depth doesn't exceed 14 meters. Overall, it offers a decent diving experience. This place can be reached by boat and is abundant with hard corals and small groups of fish. The capital animal of Andaman- Dugong, also known as sea-cow can be easily sighted here. Located near the shallow waters, the lighthouse boasts the perfect balance of beautiful fish and soft & hard corals. The water is shallow and grows deeper as you move away from the shore. The clarity of water is great which allows you to dive at night too. The Wall is an enormous underwater rock that drops down to 56 meters and allows for a very unique view of the underwater world. Covered with soft corals and a highly abundant marine life, the wall is a great place to dive if you are looking for an extraordinary diving experience in Andaman. Pilot Reef is a long strip of underwater canyon, almost 24 meters deep, which is filled with a decent amount of hard corals inhabited by some unique fishes, including, Leopard and Whitenip Sharks among others. This place is only recommended for experienced divers. Minvera Bridge can be easily defined as a big block of hard corals in clear waters, with an average amount of sea dwellers, including Sharks. 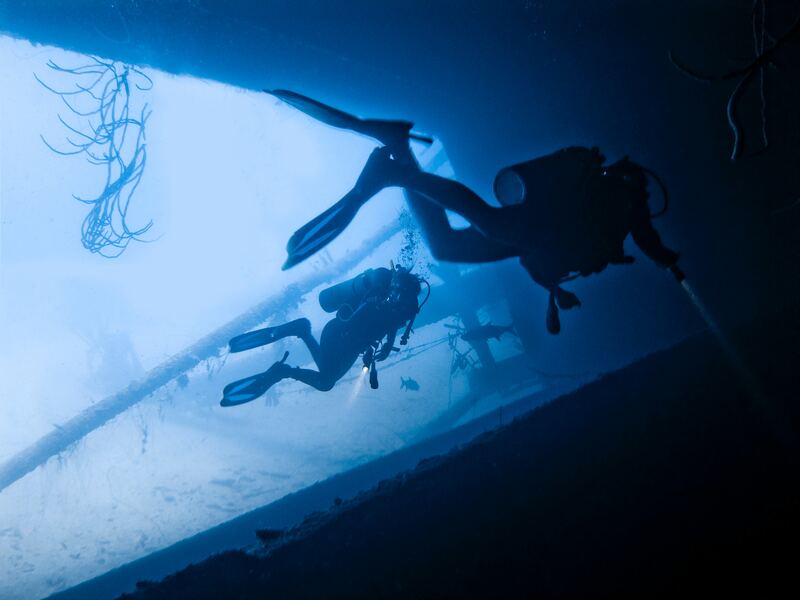 While it is only recommended for experienced divers, the site does offer a pretty unique view of the underwater kingdom and the thrill that comes with it. North Bay is a tiny island located near Ross Island, and is the second best place to dive in Andaman. The island's shoreline offers crystal clear, blue waters throughout and has a rich population of corals that presents a beautiful diving experience. The diving prices here are low compared to any other place in Andaman but the boat and transportation costs may pile up, so it's better to pre-book and plan forward. The island is so small that there is no place for additional sightseeing and exploration, so it's best for people looking for a special diving tour and don't mind spending a complete day for the experience. Neil Island is best known for exemplary hotels and resorts, however, it also offers one of the best places for an underwater dive. Although the water here is not crystal clear, it does offer a fine underwater experience thanks to the preserved marine life and alive corals around the shoreline and beyond. 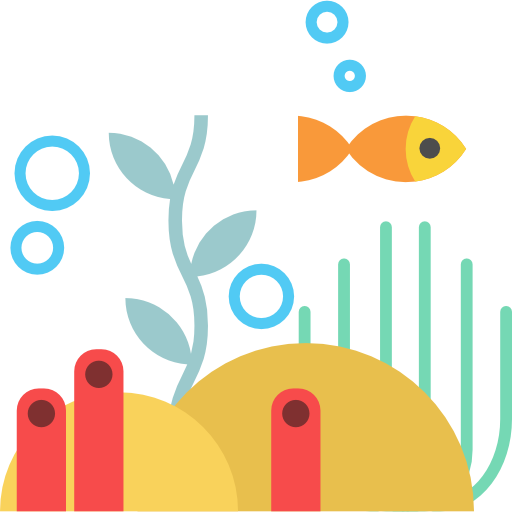 The water currents are medium and the depth is perfectly safe for an optimal underwater adventure. One thing to note is- due to low competition and less number of tourists the prices for diving in Neil can be a little high compared to others. We do recommend diving in Neil if you are unable to visit the above two places. Port Blair, the capital city of Andamans also offers a fairly decent place to dive. The Carbyn's Cove Beach located at 12 km from the Airport, offers a great place for underwater fun and adventure. The live corals near the snake island (no snakes here) are well preserved and abundant and the water is clear enough for a fine view of the underwater world. The marine life is a bit low when compared to other spots on the list but you won't be able to tell difference once you experience it. Although not the cheapest, the prices for a complete diving experience is fairly low and there are no additional transportation and boat costs, so it's best for families on a budget trip to the isles. Mahatma Gandhi Marine National Park. The cost of scuba diving in Andaman depends greatly on the island in which you’d like to dive and the vendor you select. The prices also add up in places which have to be reached by a boat, this is because the vendors usually charge extra for it. Depending on these factors the best place to dive in Andaman would be the Elephant Beach and the most affordable place to dive is Nemo Reef, both of them are in Havelock Island. Although it can only be reached by a boat, it has a huge selection of vendors who provide Scuba at a very reasonable price. Apart from this there are several other places where you can dive at a very reasonable price in Andaman. Beginners and non-swimmers can easily do scuba diving by getting in touch with the right provider. For starters, the PADI certified divers will be there every step of the way and in the water to help and accompany you through the wonderful experience and make sure you are always safe. You will learn the basics and the do's and don'ts of diving by an experienced diver. For those who'd like to become a licensed or professional diver Andaman offers a wide variety of certifications and licenses from certified schools. Beginners have to go through a Basic Open Water Course provided by either of the schools and complete the certification to get the diving card. Once you've got the diving card you can dive at basic dive sites around the world. For people who are serious about Scuba or want to become a instructor can apply for an Advanced open water course. Upon completion you can dive around the waters of upto 30 meters depth. Continuing this course will allow you to become Emergency Responder, which can be further trained and certified by PADI to become a PADI Rescue Diver and then a Dive Master. Dive Master certificate can be used to help new divers in shallow or deep waters around the globe. Which island is the best for Scuba Diving in Andaman? Havelock Island is the best place for Scuba Diving in Andaman for various reasons. The Elephant beach is surrounded with a dense coral belt that houses rich marine life, hard to find anywhere else. The cost for diving in Havelock is low too, because of high number of Scuba Providers and the best thing is, every package to Andaman includes a trip to the Havelock so you can easily save more on transportation. What is the best time to Scuba Dive in Andaman? The best time to scuba Dive in Andaman is from May to June. During this time the water is clean and there is less distortion of the sea surface due to water currents which allows for a save and wonderful dive. The diving is usually done during the morning 8 A.M to 1:00 P.M and afternoon 3 P.M to 4:30 P.M for new and inexperienced divers. After 5 P.M the dive centers are closed in Andaman. Certified divers and pros can also choose to dive at night, which allows for a distinctive view of the underwater world. The age limit for Scuba Diving in Andaman is 10 years to 60 years, which means kids above 10 years of age are allowed to dive. To dive without certification, you'll have to be accompanied by a certified instructor throughout the whole experience for maximum safety. Who is the best diving or scuba vendor in Andaman? Trainer and dive master experience. Proper permits to conduct scuba throughout the islands. Number of branches throughout the islands. Considering all these factors the best scuba vendor in Andaman would be Infinity Scuba, closely followed by coral safari team. Both follow security protocols carefully and have the best trainers and dive masters in Andaman and Nicobar Islands. How safe is scuba diving in Andaman? Scuba diving in the isles is pretty safe if you select the right vendors and the proper place to dive. For inexperienced divers, a dive master is always present at the location to assist and you'll always be accompanied by an experienced diver underwater to make sure your adventure is safe and memorable. For maximum safety, a small rescue team is present at the boat to provide assistance in need, plus the location of the dive is shared with the proper authorities in case of emergencies. 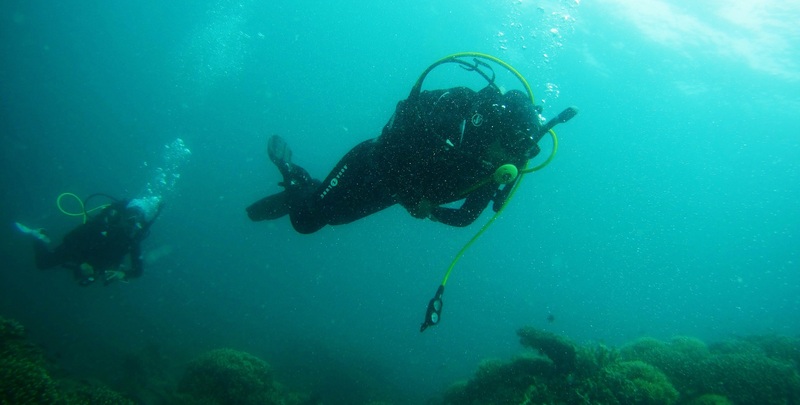 What is the depth of Scuba Diving in Andaman? Beginners and first time divers are allowed to dive under 10 meters of depth. People with diving experience and certification are allowed to dive upto 30 meters and also during night. Is it necessary to know swimming to scuba dive in Andaman? No, It is not necessary to know swimming to scuba dive in Andaman, a diver will always be there to assist you underwater. Although, knowing swimming will help you take control of your body underwater. 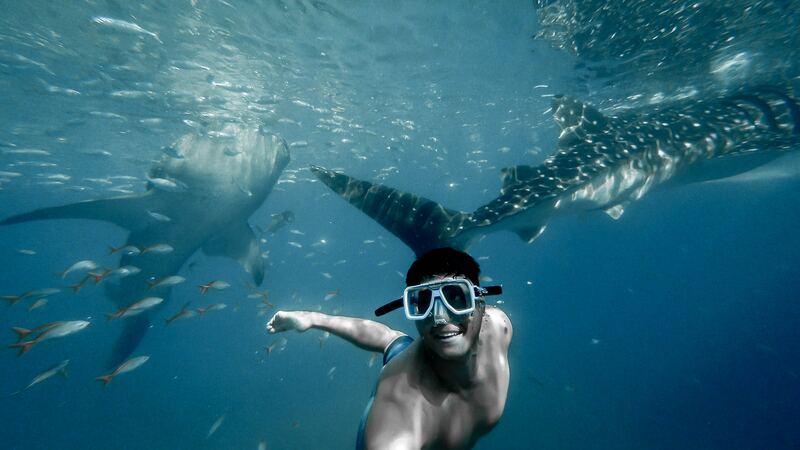 For tourists who'd like to dive casually, half day is enough to dive. For people opting for certifications and courses the range can go anywhere from 4 to 7 days. Where do most people dive in Andaman? Most people dive at the Havelock Island, Elephant beach. Closely followed by North Bay and then Neil Island. This is because these are the best places to dive and also, most of the people visiting here already have these locations in their travel plan.